The ability to smell is associated with the first cranial nerve and is often one of the first things affected in cognitive decline. 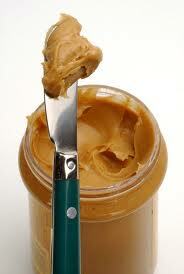 Because peanut butter is a “pure odorant,” it is only detected by the olfactory nerve and is easy to access. “Dr. Heilman said, ‘If you can come up with something quick and inexpensive, we can do it,’” Stamps says. For a small pilot study published in the Journal of Neurological Sciences, patients who were coming to the clinic for testing also sat down with a clinician, 14 grams of peanut butter—which equals about one tablespoon—and a metric ruler. The patient closed his or her eyes and mouth and blocked one nostril. The clinician opened the peanut butter container and held the ruler next to the open nostril while the patient breathed normally. The clinician then moved the peanut butter up the ruler one centimetre at a time during the patient’s exhale until the person could detect an odour. The distance was recorded and the procedure repeated on the other nostril after a 90-second delay. Patients in the early stages of Alzheimer’s disease had a dramatic difference in detecting odour between the left and right nostril—the left nostril was impaired and did not detect the smell until it was an average of 10 centimetres closer to the nose than the right nostril had made the detection in patients with Alzheimer’s disease. This was not the case in patients with other kinds of dementia—instead, these patients had either no differences in odour detection between nostrils or the right nostril was worse at detecting odour than the left one. Of the 24 patients tested who had mild cognitive impairment, which sometimes signals Alzheimer’s disease and sometimes turns out to be something else, about 10 patients showed a left nostril impairment and 14 patients did not. The researchers said more studies must be conducted to fully understand the implications. The researchers say the test could be used by clinics that don’t have access to the personnel or equipment to run other, more elaborate tests required for a specific diagnosis, which can lead to targeted treatment. One of the first places in the brain to degenerate in people with Alzheimer’s disease is the front part of the temporal lobe that evolved from the smell system, and this portion of the brain is involved in forming new memories. “We see people with all kinds of memory disorders,” Heilman says. Many tests to confirm a diagnosis of Alzheimer’s disease or other dementias can be time-consuming, costly, or invasive. “This can become an important part of the evaluation process.